(Nanowerk Spotlight) The concept of e-noses - electronic devices which mimic the olfactory systems of mammals and insects - is very intriguing to researchers involved in building better, cheaper and smaller sensor devices. 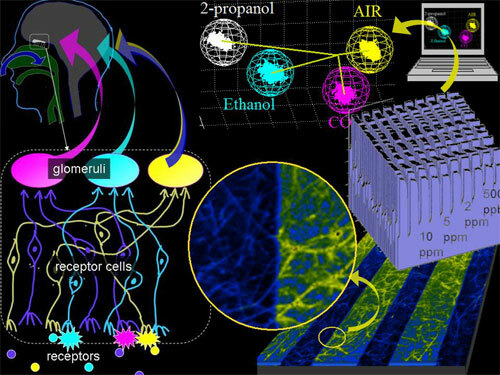 A better understanding of the reception, signal transduction and odor recognition mechanisms for mammals, combined with achievements in material science, microelectronics and computer science has led to significant advances in this area. Nevertheless, the olfactory system of even the simplest insects is so complex that it is still impossible to reproduce it at the current level of technology. For example, the biological receptors are regularly replaced during the life of mammals in a very reliable way so that the receptor array does not require to be recalibrated. The performance of existing artificial electronic nose devices is much more dependent on the sensor's aging and, especially, the sensor's replacement and frequently require a recalibration to account for change. Moreover, current electronic nose devices based on metal oxide semiconductors or conducting polymers that specifically identify gaseous odorants are typically large and expensive and thus not adequate for use in micro- or nano-arrays that could mimic the performance of the natural olfactory system. Nanotechnology is seen as a key in advancing e-nose devices to a level that will match the olfactory systems developed by nature. Nanowire chemiresistors are seen as critical elements in the future miniaturization of e-noses. It is now also believed that single crystal nanowires are most stable sensing elements what will result in extending of life-time of sensors and therefore the recalibration cycle. Last year we reported on a research effort Towards The Nanoscopic Electronic Nose. Scientists involved in this effort now report a second-generation, far more advanced e-nose system based on metal oxide nanowires. "Despite encouraging demonstrations of an array of individual metal oxide nanowires, there still exists a technological gap between the laboratory demonstrations and a practical e-nose microdevice suitable for up-to-date large-scale microfabrication and capable of operating in real-world environments" Dr. Andrei Kolmakov explains to Nanowerk. "Hence, our aim was to bridge this gap and demonstrate the excellent performance of a practical device made by combining 'bottom-up' fabricated SnO2 nanowires/nanobelts as sensing elements with a 'top-down' technology of the state-of-the-art multi electrode KAMINA platform." "Basically, we took a very robust and successful KAMINA (KArlsruhe Micro NAse; pdf download German/English datasheet, 128 KB) electronic nose platform and instead of using the traditional thin-film sensing element we implemented completely new morphology of the sensing layer, which in our case, is composed out of the layer of tin oxide nanowires" says Kolmakov. He explains that their device shows a certain degree of analogy with neurons: The randomly distributed nanowires contact each other and form multiple percolation paths for signal transmission. The resistance of these percolating nanowires is a very sensitive function of the gas environment. Due to a stochastic difference of the percolating pattern between every two electrodes (the space between each couple of electrodes serves as a separate sensor), the sensor array of multi-electrodes produces a different response pattern to differing analytes. Similar to our brain, the processor attached to the e-nose conditions and analyzes the electrical signals coming from the sensor array and, using pattern recognition techniques, produces the image of the 'odor'.? "From the point of view of the sensitivity and selectivity toward the gases we probed, this e-nose was showing the excellent results compared to existing macroscopic counterparts" says Kolmakov. "With this new methodology we are getting intriguing results, which we are still analyzing. For example, we learned that in order to discriminate between different analytes, our artificial nose does not require any temperature gradient (which is a basic principle of operation of the traditional KAMINA e-nose) and we can easily play with just a density of the percolating nanowires at the substrate to substantially change the gas-recognition properties of the array. In addition to that, there are plenty of other functionalization possibilities for our sensing elements to tune the sensor properties in a rational and easy way. That?s why we consider mimicking the net of neurons as one of the most promising paths in the development of next generation electronic noses." Kolmakov and his grup are currently testing the strategy to eliminate any heaters in the device, thus making it possible to operate a microchip at room temperature. This drastically reduces the power requirements. This work shows that gradient microarrays with sensing elements based on metal oxide nanowire mats of different density appear to be a novel technologically simple and powerful approach for fabrication of robust, cost-effective, sensitive, and highly selective nose-like gas analytical devices. This kind of nanosensor device opens a new direction in the development of extremely cheap (a few dollars, since there is no need for any expensive nanomanipulation and sophisticated top-down protocols) but yet ultra small and powerful electronic detectors which are able to recognize complex chemicals against a disturbing background of other gases and report if any dangerous thresholds have been approached. There is a huge need for these sensors in the modern urban environment, in environmental applications, and for security. Kolmakov points out that such 'intelligent' sensor systems could be installed almost everywhere – cell-phones, car dashboards and exhaust systems, manufacturing plants, oil platforms, even in soldiers' helmets etc. Moreover, the system is sensitive to ionizing radiation and can be a monitor for x-rays and nuclear contaminations. The researchers published their results in the October 10, 2007 online edition of Nano Letters ("A Gradient Microarray Electronic Nose Based on Percolating SnO2 Nanowire Sensing Elements").